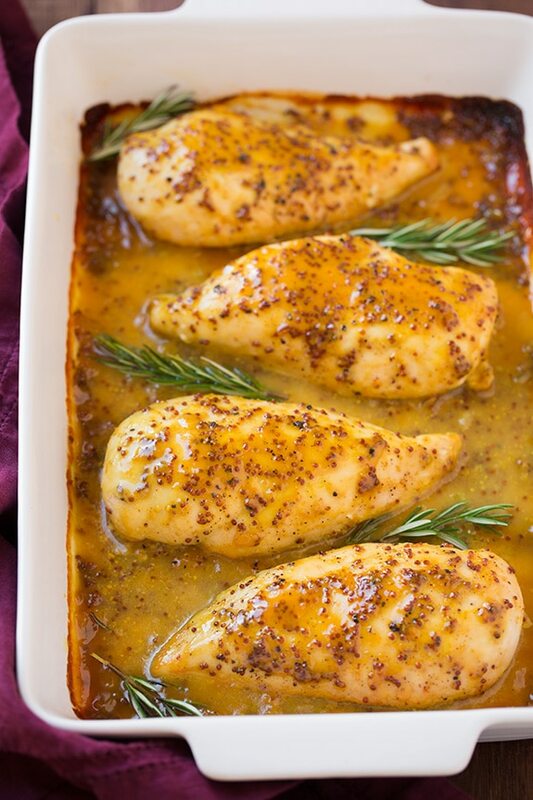 You can have this Baked Honey Mustard Chicken on the table in less than an hour, and it requires just 15 minutes of hands on prep work! Serve it with rice, buttered noodles or steamed veggies for an easy, balanced meal. I’m on a roll with chicken lately, and there’s likely more to come. Really we probably eat chicken more than any other type of meat at my house, I just sort of avoid posting chicken recipes (or any other meat for that matter) because for me it’s hard to get a good picture of it. It’s easier to make a cupcake look pretty than it is a piece of chicken, you know? 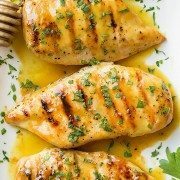 Anywho, this honey mustard chicken is seriously delicious, and it’s unbelievably easy to prepare! I quick saute of some onions and garlic, then a speedy blend of some mustards and honey, add it all to the chicken, throw it in the oven and voila! Rave-worthy chicken that no one could resist. 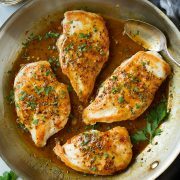 I love the simple depth of flavor this easy chicken recipe has, and the slight texture from the coarsely ground mustard. I also love what the few sprigs of rosemary bring to the dish, just the perfect amount of fresh herb flavor. I could eat this sauce by the spoonful! Honey mustard is just one of those genius combinations. Whisk together the mustards, honey and olive oil. Saute onion and garlic over medium heat to slightly soften, then spread onto the bottom of the baking dish. Season chicken breasts with salt and pepper, then lay over the onion layer. Pour mustard mixture over chicken, turning to coat evenly. 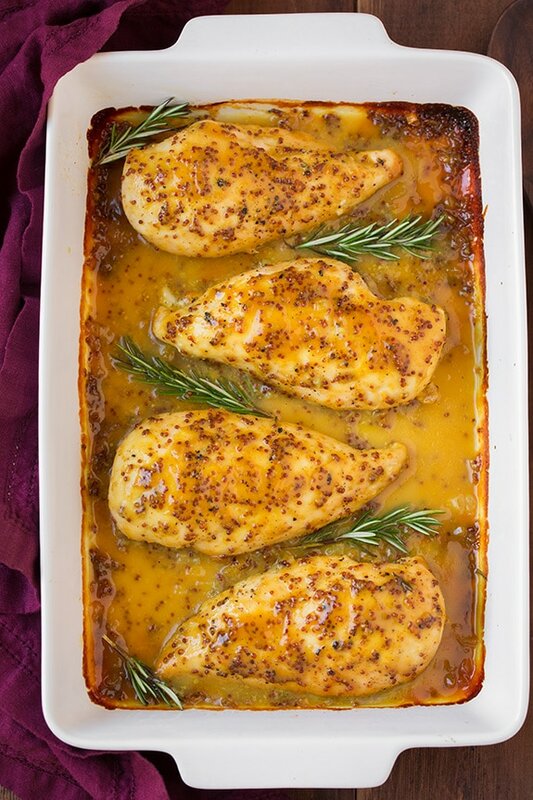 Lay rosemary sprigs between chicken breasts, then cover baking dish with foil. Bake chicken until cooked through, removing foil halfway through. Yes, you can use any cut of chicken you’d like in this recipe. Just keep in mind that the cook time will vary based on what you use. Can I Use Whatever Mustard I Have on Hand? Yes, if you don’t have the three types of mustard listed in the recipe, feel free to use whatever you have. Your honey mustard sauce won’t taste the same as mine, but I’m sure it’ll still be delicious! You’ll know when the chicken is finished baking when it’s no longer pink on the inside and the juices run clear. Alternately, you can use an instant read thermometer — if the center is 165 degrees F, the chicken is done. 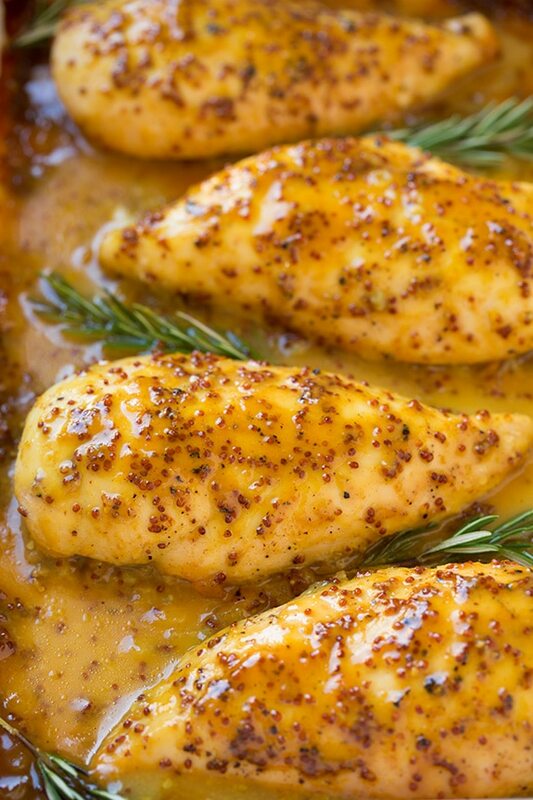 Cook times with chicken breasts will vary based on their size. I recommend using about 6 – 8 oz breasts, and if they are anyt larger I’d cut them into halves through the thickness so they don’t take forever to bake. Feel free to play around with using different types of mustard in this recipe. Let the chicken rest for a few minutes after you take it out of the oven before serving. Preheat oven to 375 degrees F. In a mixing bowl, whisk together coarse mustard, dijon mustard, yellow mustard, honey and 2 tsp olive oil. Spray a large baking dish with non-stick cooking spray (large enough to fit chicken without over crowding). In a small skillet, heat remaining 1 tsp olive oil over medium heat. Add onion and saute 3 minutes, then add garlic and saute 30 seconds longer. Pour into prepared baking dish and spread into an even layer. Season each chicken breast with salt and pepper on both sides, then set chicken over onion layer in baking dish. Pour mustard mixture evenly over chicken, working to cover each chicken breast entirely. Lay sprigs of rosemary between chicken breasts, then cover dish with foil. Bake in preheated oven 20 minutes, then uncover and bake until chicken has cooked through, about 15 - 25 minutes longer. 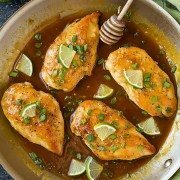 Serve warm, spoon more sauce over chicken as desired. Note that the cook time will vary based on the thickness of chicken breasts, so just keep an eye on it. It should register 165 degrees F in the thickest part of breast on an instant read thermometer. It could be less or more time than what's listed.